Free Audio Sermon titled, “God’s Love to Sinners”. We stand guilty and helpless before God but he reaches out to us in His love. (Written as an account soon after the event by Rev William Macleod, the minister of Knightswood FCC). People say there is no such thing as a free lunch but they are wrong. With our loving God all is free. He gave us His Son to be our Saviour. Daily He pours down upon us His gifts and mercies. We in Thornwood congregation of the Free Church of Scotland (Continuing) have recently been amazingly reminded of this in God’s provision for us. We had been without a church building since the division in the Free Church in 2000, and had worshipped in the assembly hall of Thornwood Primary School. We were thankful for this convenient location, the low rent charged by Glasgow City Council and the courtesy and helpfulness of the janitor. But there were times when we longed and prayed for our own church building. However with the high price of property we had become more or less reconciled to the impossibility of owning our own building. Then, out of the blue, we were offered a well-fitted and highly suitable church building just ready for us to walk in. If we had been given several million pounds to spend in building a church for ourselves this is exactly what we would have desired. God knows what we need. The school where we had been meeting had the disadvantage of being very close in location to the other Free Church (Continuing) congregation in West Glasgow, Partick, on Crow Road. But the new church is over two miles away in the Knightswood area, an entirely distinct part of Glasgow, but one where many of the congregation already live, and where in the providence of God much recent outreach work has been carried out. The congregation had already made arrangements to start a Wednesday evening outreach Bible study in Knightswood Community Centre for the winter, and has done extensive leafleting and visitation to reach local residents with the Gospel message, particularly in the high-rise council flats. The new church is eminently suitable for this work, being only an easy ten-minute-walk from the flats. The new church building has flexible seating for over 200, a back hall seating 40 which is suitable for prayer meetings, a kitchen and two additional rooms which could serve for a Sabbath School. The whole building is in excellent condition and has been extremely well maintained. Sited at Knightswood Cross, just off Great Western Road, it is easily found and is on a busy bus route. The building had been a Gospel Hall owned by a conservative Brethren assembly. Sadly, this group had been in numerical decline for some years, and has decided to disband as their leading brother has been forced to give up the work due to ill health. The Trust under which the Hall was held stated that the building or its sale value must be used for the furtherance of the gospel in Knightswood. The local members generously decided to offer it to us for the work of the Lord. We hope to change our name to Knightswood Free Church (Continuing). When our congregation were informed at a meeting on Tuesday 14th October, they readily agreed to accept the offer. Our first service in the new church will be a prayer and thanksgiving meeting on Tuesday 21st October, with a formal opening service to follow in a few weeks time. The congregation has been greatly excited by this remarkable provision from the Lord, who has done “exceeding abundantly above all that we ask or think,” and we ask for prayer that the Lord will now help us to reach out with the gospel in this new location and that many souls will be saved for His glory. All our services from now on will be held at Knightswood FCC, 361 Fulton Street, Glasgow, G13 2SP (Sunday 11am and 6.30pm & Tuesdays 7.30pm). Following the division of the Free Church of Scotland on January 20th 2000, the Thornwood congregation was formed by a coming together of those who adhered to the side known as the Free Church of Scotland (Continuing). They met in Thornwood Primary School, hence the name. They were pastored by the Rev Henry J T Woods who was the minister of Paisley at the time of the division. An Act of Assembly was passed in 2001 which brought about a union of the four congregations which they represented – East Kilbride, Briton Street, Partick Highland and Paisley. In 2005 the Rev Henry J T Woods accepted a call to Beauly Congregation and the Rev William Macleod of Portree accepted a call the following year and was inducted as minister. The Dumbarton congregation was joined to Thornwood by an Act of Assembly in 2008. 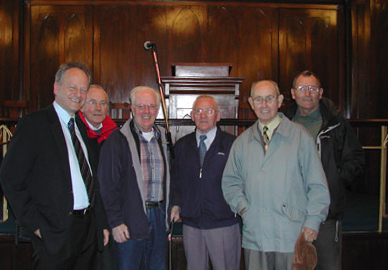 In October 2008 the congregation was gifted the Gospel Hall at Knightswood Cross by the Brethren Group who worshipped there. They had become elderly and small in numbers and their desire was that the Thornwood Congregation take over and continue to preach the Gospel in Knightswood. A more detailed account can be read here. The Free Church began services in East Kilbride in 1956, under the leadership of the Rev Donald Gibson, then in Govanhill Free Church. Services actually began in one local home, but were then held in the Y M C A and Scout Hall respectively, until the present church building was completed, The first minister, the Rev David Paterson, was called in 1962. At the Reconstitution in 2000 the congregation was vacant. The union of Grant Street and Govan congregations was approved by the Commission of Assembly on 1st March 1995. The Grant Street congregation was the direct descendant of Duke Street Gaelic Church which was formed in 1798 as Glasgow’s second Gaelic charge. In 1843 the congregation (but not the minister) joined the Free Church and following many difficulties built a new church on Mains Street. In 1900 the minister and congregation adhered to the Free Church and continued to worship in Mains Street until 1930 when Grant Street United Free Church was purchased. Following deterioration of the building the Grant Street Church was vacated in 1990. Services for the Gaelic-speaking community in Govan began in 1862 and were continued for eleven years by a probationer. The charge was sanctioned in 1874 and a minister settled. A church was erected in 1877. The minister in 1900 entered the Union and the congregation was vacant until the induction of the Rev Farquhar Matheson in 1913. The congregation of Partick Highland has its roots in the movement to Glasgow of people from the Western Isles, particularly Lewis, seeking employment in the city. It began as a Gaelic mission and was raised to the status of a fully sanctioned charge in 1924. In 1937 the congregation moved to 35 Dowanhill Street, Partick. The congregation was formed and a church built in 1961 as a result of mission outreach from Govan Free Church. The Rev Murdo Martin was inducted to the charge the following year. The Rev Henry J T Woods was the second minister. The Reformation was a radical Biblical movement. From a human point of view the printing, publishing and distribution of the Scriptures and the preaching of God’s Word was the great cause behind it. Of course the Reformation was in reality a great revival, with the Holy Spirit waking up a sleeping Church. It has been said that the Scottish Reformation was the purest of all. John Knox was not happy to retain in the Church that which had no Biblical sanction. The Scots Confession was produced and a Presbyterian Church was organised. As time passed the Stuart kings tried to suppress Presbyterianism and impose Episcopacy. In the mid seventeenth century there was what is known as the Second Reformation led by Alexander Henderson. The Church was freed from Episcopal shackles and the Westminster Confession of faith was produced and adopted. The persecutions of the Covenanters followed the restoration of Charles II to the throne, but in 1689 the Revolution Settlement saw the Presbyterian Church established as the Church of Scotland. During the eighteenth century Moderatism gradually dominated the religious scene in Scotland. This was a cold, dead religion that despised enthusiasm and indeed all experimental religion. Ministers spent their time in worldly pursuits. However at the beginning of the nineteenth century the Spirit began to move in the Church. One of the evils which had developed was “patronage”. This was a system by which the wealthy patrons or landowners had the right to impose a minister on a congregation against the wishes of the people. In the 1830s patronage was increasingly opposed by the Church and the people. Patrons however used the law courts to obtain their will. At last the Church saw that its freedom was being improperly restricted. Ministers and people were being threatened with fines and imprisonment for obeying their consciences. The Disruption took place in 1843 and the Church of Scotland Free was born. It was a popular movement and the times were ones of revival. Hundreds of ministers and huge congregations associated with the Church. There was a great emphasis on mission work at home and abroad. Large numbers of churches, manses and schools were built. The Church grew rapidly. However as the century progressed false doctrine ate away at the foundation of the Church. It is amazing that a Church so sound and evangelistic in the period 1843-1860 should in the space of twenty years become corrupt. Evolutionary teaching began to get a foothold. Increasing pride led to the ablest young candidates for the ministry being sent to the prestigious German universities where they imbibed liberalism and began to doubt the inspiration of the Scriptures. They returned home to teach and infect the Free Church. Moody and Sankey conducted evangelistic campaigns. These led to a new form of worship with popular hymns and music and a much frothier theology. It appeared for a time that this was the answer and that the Church would grow. However the end result was a weakening of the old beliefs and the new Arminian theology did not have the strength to stand up to liberalism. By the end of the century the Free Church was in a sorry state. There were still many attending, but false doctrine was increasingly gaining supremacy in the theological colleges and even the pulpits. In 1892 a Declaratory Act was passed which allowed men to become ministers without subscribing to the whole doctrine of the Westminster Confession. A decision was taken to join with the United Presbyterian Church which was the other large non-established church. The popular idea was that the Free Church would then be able to rival the Church of Scotland. It was a union taking place on the basis of the lowest common denominator of doctrine, facilitated by the Declaratory Act. From this Union some 26 ministers and a large number of elders and members stood apart, refusing to join the United Free Church. They continued as the Free Church of Scotland and after a famous court case in the House of Lords in 1904 were awarded the property of the whole old Free Church, as the rightful heirs of the Disruption Church. Our faithful Free Church fathers were not popular with the world nor with the worldly church. Towards the end of the twentieth century problems again began to bother the Free Church. Laxity of life and church discipline was becoming apparent. Serious allegations were made against a professor of theology. Those in positions of influence in the Church courts refused to deal thoroughly with these allegations and attempted to cover up the truth. Threats were made against any who dared make accusations against this popular professor. One minister who spoke publicly at the Assembly against the evil and hypocrisy which he had witnessed in the Assembly was (purportedly) suspended. Protests were made. The Free Church Defence Association had been revived to try to save the Church from declension and division. Sadly the attitude of the majority was that those who rocked the boat and made protests should be got rid of. Twenty-two ministers were purportedly suspended in one go. Things had reached an impossible level for these faithful, fervent ministers who were now being forbidden to preach. They, and a number of elders who supported them, walked out of the Assembly Hall and continued the sitting of the Commission of Assembly as the true Free Church in the Magdalen Chapel. Thus we now have the Free Church of Scotland (Continuing) which wishes to continue in all the good things for which our fathers stood. We believe in the Scriptures as the only rule of faith and life. We believe the Westminster Confession of Faith to be a good summary of the teaching of the Scriptures. We believe in Church discipline as essential to maintaining the purity of the Church. By God’s grace we look forward to continuing to bear witness to Him in the needy Scotland of the twenty-first century. Reformed – We thank God for the Reformation and adhere wholeheartedly to the Reformed Confessions especially the Westminster Confession of Faith. Evangelical – We believe that salvation is only by faith in the sacrifice which Christ offered on Calvary. Biblical – We accept the full authority of the Scriptures as the infallible, inerrant Word of God and the only rule for faith and life. Experimental – We lay great emphasis on Christian experiences. Heart knowledge is as vital as head knowledge. Psalm Singing – We believe in purity of worship – worshipping God as He Himself commands in the Bible. He has given us a book of songs, the Psalms, they are inspired and we cannot find a better hymnbook anywhere. We sing without instrumental music in worship because we follow the pattern laid down in the New Testament. Expository Preaching – The preaching is the central part of our services. We do not preach man’s philosophies but God’s truth. In expounding the text we apply the Word of God to all of life. Presbyterian – We are part of the Presbytery of Glasgow in the Free Church (Continuing) which is a national church and indeed has congregations overseas. Church Discipline – We believe in the importance of consistent Christian lives and sound doctrine. As a church we believe in disciplining those who flagrantly break God’s law, or who hold to heretical views. Authorised Version, Reverent Worship – In a day when anything goes in worship and most churches aim to entertain man, we try to please God by worshipping Him ‘in spirit and in truth’. We use the Authorised Version of the Bible because of its accuracy, majestic style and memorability. Loving – Our congregation is a most loving, caring and welcoming church. We have sermons available on SermonAudio.com under the username Thornwood FCC. Knightswood Free Church of Scotland (continuing) Blog at WordPress.com.